A dead tree is removed at El Dorado Regional Park Area III. Photo courtesy of City of Long Beach. The city’s dead and diseased trees will soon have a new role as outdoor furniture thanks to new funding that will also give local at-risk youth jobs as “urban lumberjacks,” those involved said. Cal Fire, which receives money from the state’s cap-and-trade program, is giving a $1 million grant to fund a lumber salvage and apprenticeship training program through a collaboration with the nonprofit Conservation Corps of Long Beach, the city’s public works department and the tree-trimming business West Coast Arborists. It is the first program of its kind in the Los Angeles area, said Dan Knapp, executive director of the nonprofit, which teaches at-risk youth life and workforce skills. It will turn participants into “urban lumberjacks,” he said. An estimated 1,000 deteriorating trees, affected in part by the region’s drought and now posing as safety hazards, will be removed throughout the city, said Knapp. By removing their limbs and turning their trunks into lumber, the trees will be transformed into outdoor furniture such as park benches, as opposed to ending up as firewood or in a landfill. The program is in part meant to help reduce greenhouse gases, according to Knapp. Knapp said he’s considering reaching out to Long Beach City College’s carpentry program to collaborate on the use of some of the lumber, which is considered artisan and exotic, he said. Some of the trees that will be chopped down include tropical jacaranda trees, he said. He’s not sure yet if the lumber will be sold or given away—though, because of the city’s active arts community, he is toying with the idea of possibly selling wood at local farmers markets. The grant will also allow for the planting of 2,000 trees in underserved areas of the city, specifically along the 710 corridor and L.A. River area, in council districts 1, 7 and 9. Knapp said about 90 percent of the program’s participants, ages 18-25, live in those areas. Upon completion of the program, Knapp said participants will either receive an internship with the city or be hired by the business, which are in need of trained workers. “I fully support this and other programs that provides training opportunities for the city’s young adults,” said Public Works Director Craig Beck in a statement. The proposed project was just one of six awarded in the Los Angeles region out of the 23 total projects Cal Fire awarded. 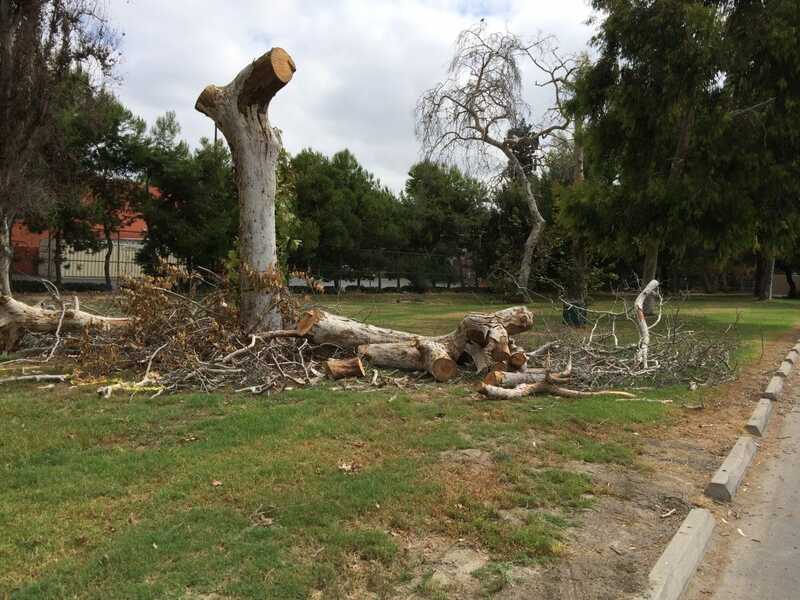 Editor’s note: This story has been updated with a new photograph showing a tree that is being removed from El Dorado Park. The prior photo depicted trees at Bixby Bluff Park that are not being removed, but rather were trimmed back and are thriving today.